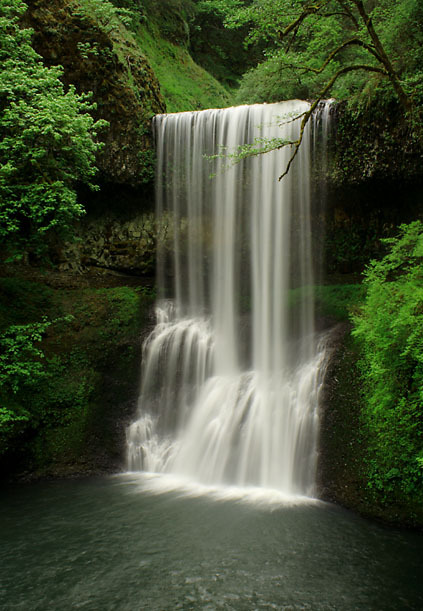 The purpose of the photo is to capture the smoothness of the falling water. By using morning lighting and a longer exposure I tried not to overexpose the water. Wow great job and congratulations on reaching one of your own personal goal by scoring higher then a 6.5. This is a fantastic photo. The flow of water defiantly fits the challenge and grabs the viewers eye. The contrast between the water and natural green color really enhances the composition of the photo. I really wish I had some suggestions but I think you have created a wonderful image. Congratulations on your 5th place that is awesome! Hopefully this falls and the other dozen in the park will get a little more DPC attention from the Oregonians and Washingtonians...hint hint Dr Achoo. Beautiful falls and photo...congratulations on the HM! Congratulations on your Top 10! Well done! Congrats on the top 10 finish!!!! You Da Best!!!! so close to Top 5 Orion! You did a great job with this waterfall. I like this. I wish I could capture a waterfall like this. The only thing I don't like is that branch that is over the waterfall. I like the softness to the water. Great composition. I love the movement of the water...and the rich green color of the trees. very nice. Did you name it Lothlorien on purpose? Looks like a lot more water coming over at this time of the year. Proudly hosted by Sargasso Networks. Current Server Time: 04/22/2019 02:49:55 AM EDT.